Guidance studies, tools & practices, handbooks & publications. Publicity activities and joint actions with other European networks at national level to inform students, young people and the general public. Guidance practitioners, career development advisors, teachers, trainers, information officers in education, training and employment sectors. Interested citizens (school and university students, parents, the unemployed, professionals, parents etc.) that seek information about counseling and vocational guidance services and learning, employment and mobility opportunities. 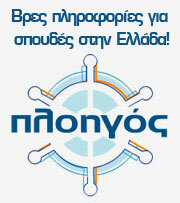 National Database of Learning Opportunities “PLOIGOS” http://ploigos.eoppep.gr The Greek National Database of educational opportunities called " PLOIGOS ", developed in 2009 by the Euroguidance Centre of Greece, provides information to Greek and European citizens (students, job seekers, parents, guidance counsellors, teachers etc.) about learning opportunities of all types (General Education, Vocational Education and Training, Special Education etc) and levels of education in all geographical regions of Greece. The database contains more than 13.000 educational opportunities which are regularly updated with the participation of educational opportunity providers. PLOIGOS is connected to the European Portal for Learning Opportunities and Qualifications in Europe http://ec.europa.eu/ploteus/en promoting educational mobility throughout the European space. PLOIGOS is currently further developed within the 2014 - 2016 Euroguidance activities of EOPPEP (project “Euroguidance National Databases for Learning opportunities» 386400-LLP-1-2013-2-GR-KA1-EUROGUID). 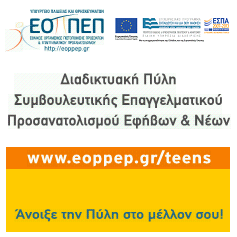 The Interactive Guidance Portal for adolescents and youngsters www.eoppep.gr/teensThe Portal was developed by EOPPEP at the end of 2012 is widely used by students, young people and guidance practitioners. Friendly career tools enhance the access of more users to guidance in the field of education, such as: Digitized interest, values and decision making tests, E-portfolio development Tool available also in English language, “Ask the counsellor” section, Thematic information catalogues and Useful Links. Soon you can find the Real Game for adolescents aged 12-15 and 15-18 and also Videos for professions and basic skills. 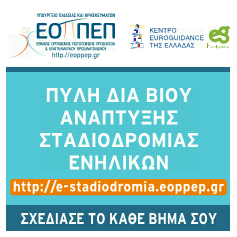 The Lifelong Career Development Portal http://e-stadiodromia.eoppep.gr/ The newly developed Lifelong Career Development Portal is supported within the activities of EOPPEP as the Euroguidance Centre of Greece, providing innovating services for career development and mobility information targeted to adults of all ages (Digitized career tests, E-Counselling Services, E- Lifelong Career Portfolio Development Tool, Career & Mobility information Resources, Career Management Skills Section).